Someone found a cave painting on a masonry wall block…. Excitement is growing around “ancient” paintings discovered on the blocks of an ancient stone wall in Aulago (Gérgal) which some experts think may be prehistoric cave art. The paintings were discovered by a local man called Miguel Brocal, who alerted the authorities to their presence. What he was doing levering the blocks out of the wall has not been vouchsafed, one hopes he was simply repairing it. 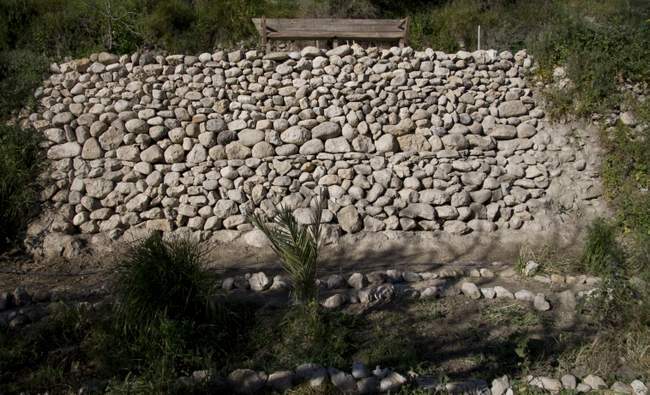 A unit formed of architects, conservators and art experts from the National Police inspected the blocks, which were quarried nearby in the last century to form a retaining wall on a path down to the local river, and decided to transport them to the Archaeological museum of Almería city. Underneath the grime of centuries, experts have made out the ochre painted figures of animals and other vague figures which correspond with other ancient cave art found in the province. Now the museum has authorised the blocks to be cleaned by a team of experts to remove the surface dirt and expose the artwork underneath. The blocks will be fully documented before work to clean them begins. The cleaning process is a meticulous manual effort where tiny brushes are used to dislodge dirt and organic matter, which is then hoovered up. Experts continue to examine the original wall, and are trying to ascertain where the blocks were quarried from. This entry was posted in Blog and tagged blocks, cave, gergal, masonry, painting, wall by David. Bookmark the permalink.